A common thread in many of these critiques is that this Millenial support for socialism is the result of a mix of anxiety and ignorance; driven by their coming of age after the fall of the Soviet Union and Mao’s rule in China but during the Global Financial Crisis, with many finding it hard to secure the middle class lives they expected. However, these studies have often made assumptions about the ways respondents understand the term ‘socialism’. Are there generational or other differences in how it is interpreted and does this influence the way people answer questions about the topic? To understand what Americans and Australians think of socialism, the United States Studies Centre and YouGov surveyed 1,000 respondents in the United States and 1,056 in Australia in late March 2019. We found that when we dig down into the attitudes of voters, despite fewer older Americans and Australians saying socialism would be good for their society, they describe it in broadly as positive terms as younger voters, and support many of its core tenants at roughly similar rates. Older Australians use more positive words to describe socialism than younger people. In the United States it is those in the middle age group. Younger respondents were less able to coherently explain what they thought socialism was, but this rate was generally low for those younger respondents who supported more socialism (especially in Australia). Although younger Australians and Americans are more likely than older respondents to say that more socialism would be good for their country, in Australia it was older respondents who were more likely to prefer the government actually running most of the economy. In both the United States and Australia, older respondents were also more likely to support the government providing guarenteed jobs and living standards. Much of the difference observed between Australia and the United States in terms of support for government involvement in the economy was driven by Republicans. When it comes to the government owning and operating most major parts of the economy — roads, healthcare, public transport, education, utilities — Coalition voters look much like Labor voters, and older Australians are more socialist than younger voters. However, in the United States, older voters are much more suspicious of government ownership, and most Republicans do not even believe in government ownership and operation of schools or roads. 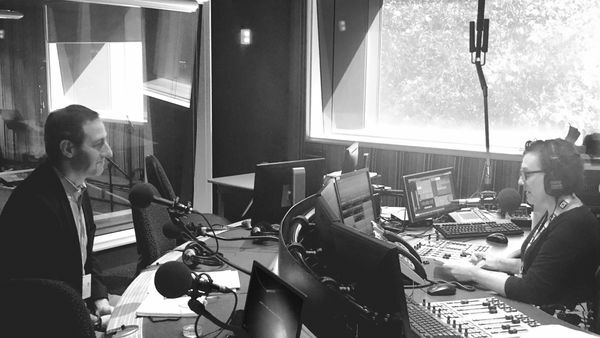 We gave Australians and Americans the opportunity to tell us exactly what they thought, by asking the question "What is your understanding of the term 'socialism'?" and allowing them to provide any answer they liked, in their own words. In the figures below we plotted the words Australians and Americans used to describe socialism. Words Australian’s associate with socialism. 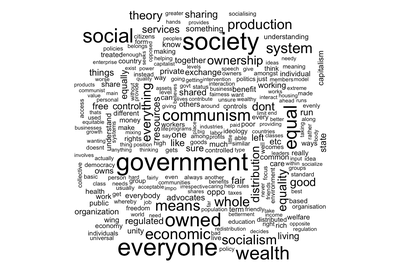 The larger the word displayed, the more frequently respondents used it to describe socialism. Words Americans associate with socialism. 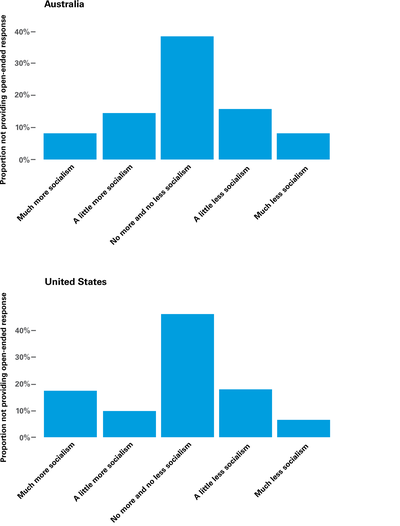 The larger the word displayed, the more frequently respondents used it to describe socialism. Australians were more likely to talk about ‘community’, ‘society’, ‘ownership’ and ‘wealth’. 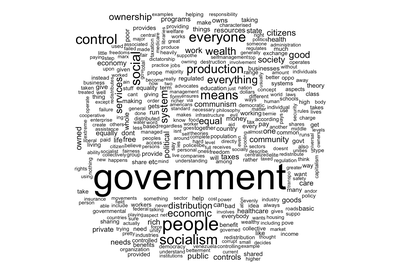 Although ‘government’ was mentioned frequently by Australians in connection with socialism, for Americans it was the most common descriptive word they used. Everything else was secondary. What precisely did these respondents say about socialism that was so positive, and negative? One Australian respondent described it as ‘for the good of all’. Others that: ‘Socialism is where the government controls the wealth of people’ and that it involves ‘good for me’. A few were perhaps a little more mercenary, saying it was ‘Equality! Sharing the wealth and sharing the poverty’. Other respondents were less positive. One said: ‘They are criminals’. Another said of socialism that: ‘Its a bad thing people got’. One just said ‘bad’. As can be seen in the figure below, when answering this question, most respondents said they did not think Australia would be improved if it had more socialism. However, a larger proportion thought the country would be better if it had more socialism rather than less. In the United States, most respondents believed less socialism was preferable. When we compare our the results of our sentiment analysis to these results, we find that respondents who thought that their would be improved if it had more socialism were also more likely to use positive words to describe socialism. This validates both methods as potentialy useful for measuring socialism. We then addressed recent claims suggesting young Australians and Americans preferred socialism more than older voters. 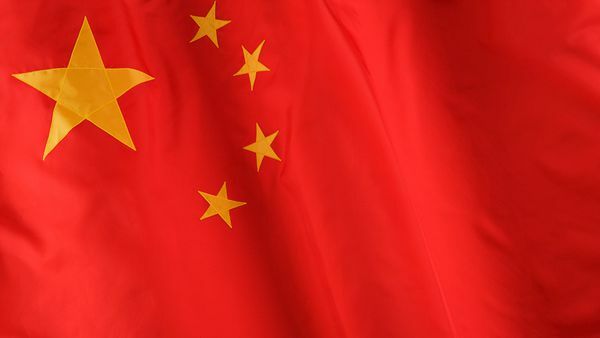 It has been suggested that this is because they are too young to remember the horrors of the Soviet Union and Mao’s China. However, our results suggest older Australians and Americans are more likely to use positive words to describe socialism. However, younger respondents were more likely to say they think greater levels of socialism would improve their country. We then addressed the claim that it is ignorance that leads to greater support for socialism. We did this by examining those respondents who were unable to explain what they understoof the term ‘socialism’ to mean. This included those who provided nonsense explanations (‘social activities’, ‘they should on Twitter and Facebook and Instagram’) or who just could not provide one (‘I’m not sure’, ‘no idea’, ‘I really dont know’). Our results suggest some of the criticism is valid. As can be seen in the figures below, for Australia. 28 per cent of Australians fell at the first hurdle, with 'don’t know', 'unsure' or 'no clue' responses. Another 13 per cent of Australians reported the term means being 'social' or 'sociable', spending time with friends, or talking with others (those who believed in meant using Facebook or Instagram were particularly interesting). Just 59 per cent offered a response that was even close to any conventional definition of socialism (greater equality, socialising the means of production, etc). The rates of being unable to provide a response, or believe ‘socialism’ meant to be ‘social’ were highest among the youngest respondents, with more respondents under 20 unable to define socialism than define it. Things are different in the United States, though. The 's' word has been thrown around far more frequently in America than in Australia. 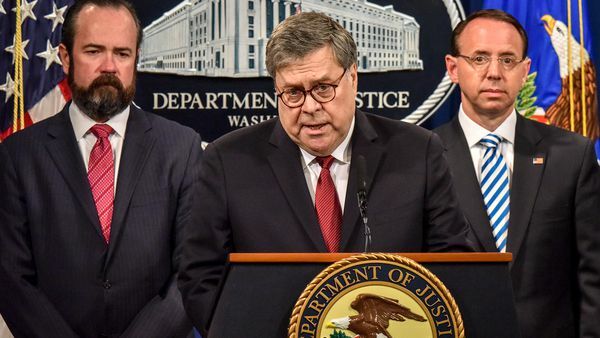 While 24 per cent of Americans were still unable to provide a coherent response, only 2 per cent said they believed the term meant being 'sociable', or similar. In the United States, 74 per cent offered a response that was close to a conventional definition. 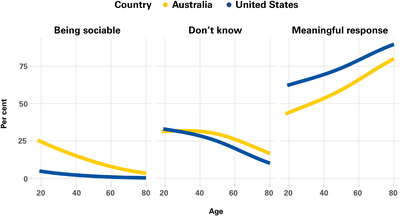 Although younger Amerians were less likely than older Americans to be able to define the term, more than 60 per cent of even the youngest groups could still do so (compared to less than 30 per cent of young Australians). It is not necessarily ignorance driving support for socialism. In the figure below we plot the proportion of respondents unwilling or unable to provide a credible explanation of socialism, by their preferences for more or less socialism. We do this for both countries, and find that it is not respondents who support (or oppose) socialism who are unable to articulate what it means. Fewer than 20 per cent of Americans who thought more socialism would be a good thing could not articulate what socialism meant in a free text questions. For Australia, the figure was even lower, at less than 10 per cent. In fact, pro-socialist Australians were more able than most to explain what the term meant. Rather, it was those who are unwilling or unable to take a position who could not explain the meaning of the term. When trying to understand how our respondents felt about socialism, we wanted to get at the ideas behind it. This included how our respondents felt about whether it was better if the state or the private sector managed most of the economy (a key tennet of socialism). When examining the data from this question, we found very different results in each country. 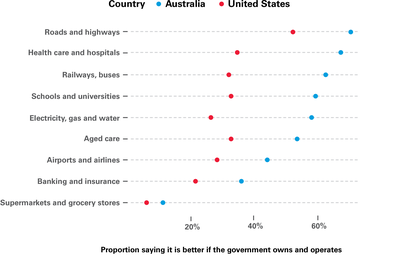 The overall patterns were similar: roads and highways, healthcare and hospitals, were the most popular areas of government ownership and operation in both Australia and the United States; banks and insurance, supermarkets and grocery stores were the least popular. However, in Australia support for government ownership and operation was high for almost everything. It was only airports and airlines, finance and retail that there was not majority support for public onwership. In the United States, support for government ownership and operation was lower, and only a majority proposition for roads and highways (and then only barely). These different results are explained by two factors: the different partisan patterns (detailed below) and opinions of older respondents in the two countries. 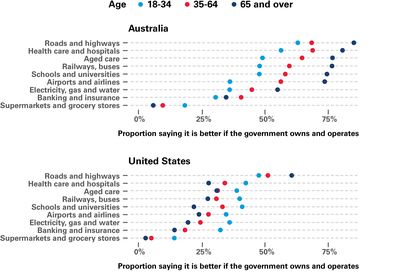 In Australia, voters aged 65 and older were much more likely to support government ownership of key parts of the economy. Of the nine types of businesses we asked about, this group of voters supported public ownership for six at rates of around 75 per cent or higher. Australian respondents under the age of the 35 were much less likely to support public ownership. However, for five of the nine types of businesses we questioned them on, this support was still around half, or higher. In the United States though, all age groups generally had low levels of support for government ownership and operation. Younger respondents were generally more supportive, but this was always minority support. The only segment of the economy older voters were more supportive of public ownership — and the only one there was majority support among any age group, was roads and highways. Moving to partisan patterns, we can see that a large part of the difference between American and Australian respondents on these issues is the difference between voters supporting right of centre parties. As the figures below demonstrate, Democrats look like Labor voters on most of these issues, showing very high levels of support for public ownership throughout much of the economy. Republicans do not look like their Coalition counterparts, however. 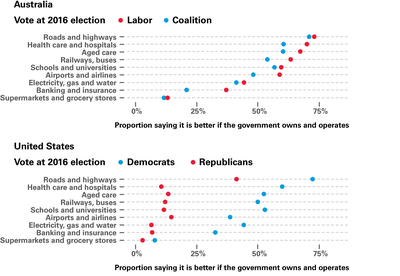 While there is little difference between Labor and Coalition voters on most of the business types we asked them about (healthcare and hospitals, banking and insurance, are the only two exceptions), the differences between Democrats and Republicans are vast on every item except supermarkets and grocery stores (where Democratic support for government ownership was low). Republican acceptance of public ownership was below 25 per cent on every item (including healthcare, public transport and education) except roads and highways. Even on the latter support for government operation was under half. 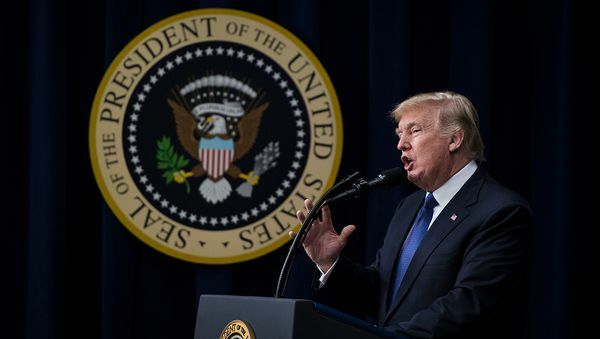 it is these partisan differences, and the very low level of support for government involvement in the economy by Republicans, is what drives many of the differences we observe between Americans and Australians on these issues. Responses were weighted by YouGov to ensure samples representive of the Australian and American populations. The Australian sample was weighted by age, gender, education, region (crossed with city, non-city) and vote at the 2016 Australian federal election. The US sample was weighted by age, gender, race, education, region, voter registration, and vote choice in the 2012 and 2016 presidential elections. The margin of error is approximately ± 3 percentage points for results reported for the full sample of both the Australian and American surveys. It is larger for sub-groups of the full samples and for differences between the countries.